When thinking about this RHS writing project, some of you may have felt your perspective is not important or that you don't write with enough sophistication to contribute. (Remember, you can still submit essays for our web site and you don't have to avoid all the grammatical errors that we learned at RHS). Well, if you have been intending to write, and if guilt has a part in slowing you down, just tell the inner demon to take a walk or ask it to sit in the room next door and read the Sunday paper to allow you the space and time to prepare your thoughts for the web project. Perhaps you could set a timer for 20 minutes and start writing whatever comes to your mind, even if it is blasphemy about this project or about some mal-favored teacher from Rolfe. Maybe it will take more than one session to prime the pump, but my point is that you simply start and not worry if what you write is good enough or appropriate. You can always refine your raw material. It's a lot easier these days to edit text with computers than it was when students relied on writing by hand or using a typewriter with erasable bond paper or Correcto-type ribbon. And besides, the old patriarchs and matriarchs of RHS won't be grading your work. Many of them have passed on, and the ones still living would probably be glad to read your thoughts. And if they're not, to heck with them. Besides, it's a new era. You can write for your own benefit and express what you want and have fun (well, maybe "fun" isn't exactly the right word, but you get the point). And your current audience (in this booklet or on the Internet) is more diverse and open to a variety of ideas than was the case within the confines of RHS. One good argument for not writing for this project would be that you have more important priorities for your creative energies and that you don't have any fondness for or loyalty to Rolfe or your school experience. That certainly would be understandable. I actually don't have a lot of love for my K-12 experience, and I often wonder why I volunteered to be on the all-class reunion committee or why I put so much energy into creating the web site or this booklet. I first considered doing the project when pondering how to share the photos that I have of Rolfe and RHS in my documentary collection. A web site seemed the perfect vehicle for putting photos out there for all sorts of Rolfe people and expatriates to view. People wouldn't have to come to Greater Rolfe Days and the high school reunion to look at a bulletin board and wouldn't have to take time away from visiting with friends while in Rolfe to view photos. The goal of instituting a cyber photo gallery has been accomplished. Many thanks to Randy Martin, our webmaster, for all his work. Although I am a photographer and the web site helps show off my collection, my biggest desire in creating the site was for it to be an avenue of discourse. It could be a new means of conversation, combining the best elements of a traditional all-class reunion with today’s cyber technology. Sure it’s great to have a face-to-face conversation with old friends on Main Street, at a park, in the school, or at the rec room of a private home. However, a web writing project allows "a web" of connections that can be ongoing and not limited to whether or not you matriculated through the hallowed halls of the Rolfe schools at the same time as your fellow correspondents. Also, web communication could have a freedom that doesn’t exist at some typical class reunions. Have you ever gotten a meaningful conversation going at one of those events and then have Mr. or Ms. Popularity from your class make a teasing remark or have Mr. or Ms. Bigshot make some insensitive comment that dampens the experience? My intent for this project is "discourse" in a way that was different than when we were in high school, both because we are older (and perhaps wiser) and because of the kinds of connections afforded by cyber technology (or the ability to self-publish a book such as this one.) That’s why I nudge people to write, but like another adage says, "You can lead a horse to water but not make her drink." There’s another value in having all sorts of people write for this project. It has to do with the multitude of perspectives that come out of RHS. It’s been said that no two people grow up in the same family. That’s because the configuration is different for the first born than the third born. By the time the third child arrives, parents have grown older, there are new sibling dynamics, and newspaper headlines have changed. For instance, there is a difference between the perspective of the first child who was born early in WWII and the third child who arrived in 1945 when the Allied Forces celebrated their victory in Europe. A Photo is Worth 1000 Words, But . . . The value of a collection of essays or a cyber forum is that all sorts of perspectives can be shared. That is not true of a photo gallery. I still encourage people to submit photos, but the problem with the photos is one of content, even if the focus, composition, and quality of light are good. Simply put, high school photos are usually of highly visible persons and popular activities. Such collections include sports photos, especially those of winning teams. There are also Homecoming photos of queens (later some kings) and royal courts. But what do we know of the stories behind these photos? In the portraits of athletic teams, the players look clean cut, handsome, and sometimes smart, but what do we know about the group dynamics of the team or the character of the individuals? Which ones were admired by fellow students and which ones were jerks? 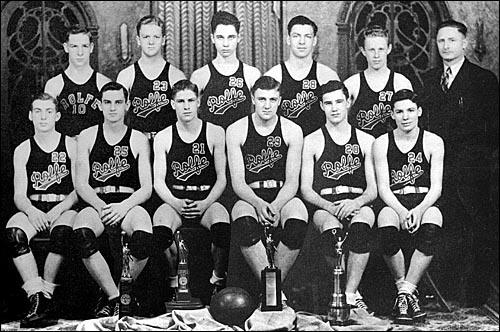 A basketball player from the 1930s who led his team to the state tournament would play basketball at a state college and be a stellar citizen, remembered with admiration for decades around the state. Years later, a star Rolfe football player would play ball at a state university but have mental health problems, become an unattractive hermit, and die a lonely and messy death on his family’s farm. The point is that sports photos don’t tell much about the people in them. The photos don’t tell what the players loved about the game, what pressures were exerted on them to be high-level achievers, what obstacles they had to overcome to gain success, what their regrets were, and whether they would turn out "good or bad." Another problem with sports photos is they capture only one dimension of the school experience. What photos do we have of Max who was in my class? He wasn’t on any high school sports teams or in any of the status activities, but I recall him being the only one in Mr. Nagle’s physics class who could explain to me how a piston recycled to its original position following a blast of internal combustion so it (the piston) could again exert its power. (I’m sure a true car mechanic would describe the process with different words, but I am doing my best.) I remember Max drawing a diagram of a crank shaft. (I’m quite sure that’s what it was. Where are you, Max?) After viewing his sketch, everything made sense when no other explanation helped. What do we know of his story or perspectives? Do we have photos of Nancy, class of 1962, who was a valedictorian but absolutely no good at sports? I can remember her in her white, broadcloth physical education uniform during a volleyball class. She would shrink and back away if the ball came her direction. Nancy would have preferred to have me cover for her and hit the ball back, but I knew Mrs. Hodoway was grading for teamwork and that if I helped Nancy, I would be marked down for hogging the ball. What do we have of Nancy’s story or her perspectives? She is gone now, having died from multiple sclerosis in 1991. What stories or perspectives do we have of students who had no opportunities in sports because they had to help their parents on the farm, work at jobs in town to earn money, or were female when there were no sports opportunities for girls? I am proud of my collection of photos and pleased that technology allows us to make them available in cyberspace. However, even though "a picture can be worth 1000 words," the photo gallery does not tell the stories and perspectives of Rolfe citizens or students. That’s why the essay and forum pages have such great potential. They can be avenues for discourse that include football and basketball but that also tell a myriad of other experiences and thoughts that have been overshadowed by popular and highly visible images. "Often I quote The Oxford Companion to Chess, which tells us that ‘there are 2 x 1043 different legal positions on a chess board, and it has been estimated that the number of distinct 40-move games is 25 x 10115, far greater than the estimated number of electrons in the universe (1079).’ No doubt estimates of that final figure have been revised upward ever after the astronomers who used the Hubble telescope and other such instruments reported their discovery of 100,000 billion new galaxies, each with roughly 100,000 billion ‘stars.’ And that is not the limit of things. Still it is safe to guess that the number of options on a chess board keeps ahead of the expanding universe. "I often follow up this chess illustration by telling of the time I asked a University of Chicago mathematician if those figures sounded proper. ‘Oh, yes.’ In other words, I responded, they are ‘infinite.’ ‘ Oh, no!’ he shot back. Infinity was for the divinity school. For disciplines such as astronomy and mathematics, he counseled, just think of a very large number. "There are several trillion more cells in the human cortex than there are places on a chess board. So multiply that larger number by the number of people who care about rural America and rural churches and you have, no, not infinite, but, yes, ‘a very large number’ of possibilities to imagine when dealing with their future." The gist of Marty’s talk and what I am saying are different, yet the discussion about a “very large number” of possibilities is important in both of our messages. How many distinct stories can there be from one school? There are at least 100 years of RHS history and that would be 100 graduating classes, with let’s say an average of 20 students per class. That’s 2000 people. Then toss in the number of administrators, teachers, and other staff members as well as parents and friends of the school. Then consider all the trillion cells that each of us has in our cortex (Where’s Mr. Head, my human physiology teacher? What exactly is the cortex?) Then factor in that some people were the oldest children in their families, some the middle, and some the youngest. That some people loved Miss Marcum and some quit school because of her style. That some people excelled in trigonometry while others excelled in vocational agriculture. That some were always going steady and had dates but others never dated. Indeed, this is only the beginning of the list. There could be an infinite number of stories and perspectives from RHS. Writing is a significant tool for looking at the past and imagining the future. Writing can also be beneficial to a person’s health. So take pen in hand or sit down to your computer keyboard and craft your thoughts. I can be more pessimist than optimist, and when thinking of the “cup as half empty,” lament there have not been more people willing to write essays or participate in the web site. Indeed, we are missing many great stories n some fun, some challenging, some tender. One woman who graduated in 1952 told me about being a student in Superintendent Mortensen’s senior government class the year the new gym was built. She said he spent a lot of time looking out the window watching the construction and talking about the progress of the gym. One day she wrote a note to her boyfriend (now husband) saying, “Mort is talking about the gym again, so I’ll take this opportunity to write to you.” She continued with sweet talk, addressing her friend as “Honey.” Then on her way to the next class, she handed the note to the friend, but “Mort” caught her in the act and wanted the recipient to turn over the note. The boyfriend agreed only on the condition that Mr. Mortensen not read it. The next morning in class, Mr. Mortensen said, “Something happened in this class yesterday that I never want to happen again.” He told about the girl’s reference to him not teaching but talking about the gym. He ended his lecture by instructing the girl, “Now Miss _____, you teach the class.” The girl was uncomfortable and the room, quiet. She realized Mr. Mortensen had read the entire contents of her note, not only her criticism of him but her romantic remarks. She went ahead and did her best to teach the class but said it was fortunate her classmates helped as best they could. Few, if any, had done their homework adequately since they had anticipated that, as was his custom, Mr. Mortensen would talk about the gym and leave little time for the government curriculum. Despite her embarrassment and his questionable use of authority, the woman has high regard today for her former superintendent, claiming he did a lot for the school. A good-hearted fellow, now in his 60s, tells about the crush he had on a girl beginning when he was in fourth grade. As a kid, when he signed up for band, he chose the same brass instrument she played in hopes of sitting next to her. As a teenager, he worked as a hired hand for the girl’s dad and lived with the family during the summer, again so he could be close to her. Sometimes the girl and boy would go to a movie in Poky, and at night, his heart would pound as he tried to fall asleep in the room down the hall from hers. However, he doubted she knew how strongly he felt for her. He worked a second summer on the farm even though the girl’s father was a taskmaster. In his mid-twenties, the young man visited the girl (now woman) in northern California. She confided she had always liked him because he didn’t put moves on her but added she viewed him more as a brother than a serious date. The news was hard on his ego, but he appreciated her candor and willingness to tell him about the long-term relationship she was in with a woman. He eventually married but always held a fondness for the woman he first fell in love with in grade school. Although he lived many states away, he grieved his friend’s death from cancer and regretted he had not followed up on intentions to write or call her after hearing of her illness. A mother of six RHS graduates has talked to me several time about her son who was popular, president of the student body and graduated in 1970. She said each year she goes through a low spell for a week in July prior to the anniversary of the boy’s death. He was killed in a construction accident the summer following his senior year. The woman also said she was puzzled for several years when she decorated graves at the cemetery because there would always be a simple potted plant with a single bloom n a mum or violet n or a cut flower lying on her son’s grave. She had no idea who left the flowers until one day she confided to Pocahontas co-workers about the mystery, not expecting they would know the identity of the giver. Another staff member overheard the conversation and spoke up, saying her own son was the one who had been leaving the flowers. She explained that students often picked on her son in school and that the young man who had been killed, although a few years older than her own boy, had always stuck up for him. Each year, her son would ask his mom for a ride to the cemetery to place a lone flower on the gravestone as a way of saying, thanks. Who knows what else that sensitive teenager felt and wanted to say. Indeed, there is a sea of stories about the RHS experience, but I need to remember it’s okay more people have not written. When I think of the “cup as half full,” I realize we have a great project and the people who have contributed should be proud of it. Rolfe’s town motto is “Some bigger, none better.” In the same spirit, not many high schools can claim a better attempt to stimulate cyber connections and alumni discourse. Perhaps by 2005, enough new essays will accumulate to create a new edition of this book. However, there is the adage to take one step at a time and the maxim to live in the present. With the July 2000 reunion behind us, autumn here and the corn and soybean crop harvested, it is also the season to complete this Y2K edition of Rolfe High School essays and know it is good and sufficient. We have gathered some great stories and reflections and invite readers to share in our harvest. As I prepare the book for the printers, I feel immense gratitude for the writers, donors, and other people who made the project possible. Thanks for your correspondence and conversations, and especially for your essays. Post Script #1. Would someone like to write an essay helping us comprehend what “a trillion” means? I don’t remember hearing much about the term in junior high math from Miss Pattee or in high school algebra and geometry from Mr. Maxon. I’ll bet the number is unfathomable to many people of my generation and older except for those who regularly calculate the national budget, keep track of Bill Gates’ income, or study the cosmos. Post Script #2. The essay guidelines are on the web site and in the back of this book. Post Script #3. I don’t know for how long a time it was fashionable for high school girls to wear what was called a “drape” for their senior portrait sittings. It was a strapless, black thing worn on the upper torso but leaving the neck and shoulders bare. I had no desire for that look in my senior photo but wanted to wear a cherry-red, crewneck sweater I had purchased from the Sears Roebuck catalog. I wore that sweater a lot, always with a tailored shirt underneath, its collar enhancing the neckline. The look was me. When our class rode the school bus to Don Peterson’s studio in Ft. Dodge for portraits, I took both the sweater and a shirt. My friends agreed it was okay to wear the sweater, even if it wasn’t dressy or “feminine,” but they insisted I not wear the shirt under it. Also, in those days, my standard hairdo was short and straight during the spring and summer months until school started and Mother announced that all the “nice girls” were getting perms and that I should get one, too. And what can I say about my pointed eyeglasses? Somehow they seemed okay. Today, I regret I no longer have the cherry-red sweater, but am glad I could make a fashion statement (even if a subtle one) when I recently had a photo taken and wore a tailored shirt with button-down collar under my sweater (actually sweatshirt). So much for fashion.